The United States, Canada and Mexico have been in lengthy talks over changes to the North American Free Trade Agreement since President Trump threatened to scrap the historic treaty. 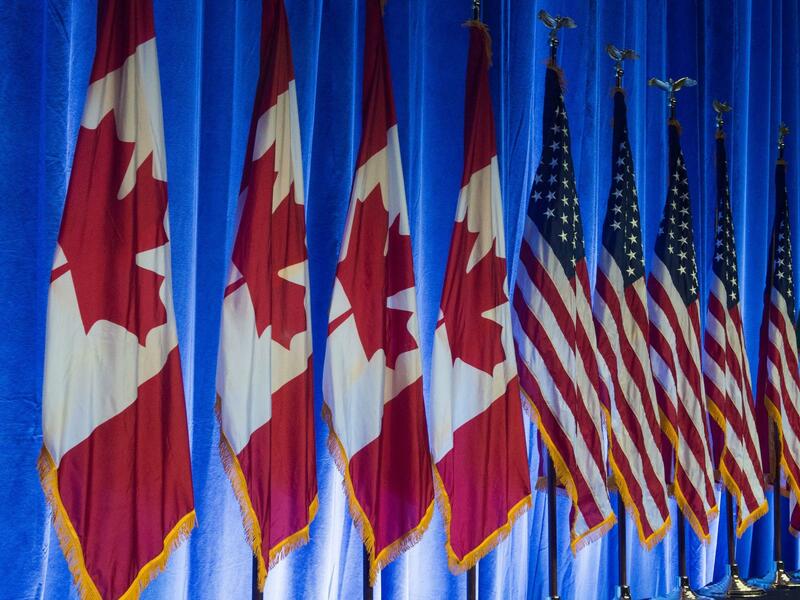 The White House dismissed a report by the Toronto Star that President Trump said he is not making any compromises in the talks with Canada and that a deal would be "totally on our terms." "The Canadian and American negotiators continue to work on reaching a win-win deal that benefits both countries," Lindsay Walters, White House Deputy Press Secretary, told NPR. But later Trump seemed to confirm the report, tweeting: "Wow, I made OFF THE RECORD COMMENTS to Bloomberg concerning Canada, and this powerful understanding was BLATANTLY VIOLATED. Oh well, just more dishonest reporting. I am used to it. At least Canada knows where I stand!" The White House said a deal with Canada had to be reached by Friday, when it would send the Mexico agreement to Congress for a 90-day review required by law. The new agreement would take over for NAFTA, the landmark pact reached in 1994. That deal was struck between three countries — Canada, the U.S. and Mexico — and removed many barriers to trade and investment among the three countries. Originally proposed by President Ronald Reagan, NAFTA was approved by Congress after lengthy negotiations and signed into law by President Clinton. Since the agreement took effect on Jan. 1, 1994, trade among the three countries has skyrocketed, and industries such as autos and trucks have flourished under elaborate supply chains that crisscross national borders tariff-free. While most economists believe NAFTA has benefited the three countries, critics say it has also hurt U.S. and Canadian workers by accelerating the flow of jobs to Mexico, where workers make lower wages. During his presidential campaign, Trump frequently took aim at NAFTA, saying the U.S. was being taken advantage of by the other countries, a charge he often makes about U.S. trade relations. On Thursday in an interview with Bloomberg News, he threatened to pull the U.S. out of a key international trading group, the World Trade Organization, if they "don't shape up." If a deal is finalized Friday, its future is unclear. Any new deal must be approved by Congress, where views about NAFTA's impact have been mixed over the years. U.S. law requires a three-month waiting period after a deal is completed before Congress can ratify it. Another factor in the timing of the agreement is that Mexico will swear in its incoming president, Andrés Manuel López Obrador, on Dec. 1. If a pact isn't signed before then, López Obrador could demand changes — and a deal that took years to negotiate could unravel. The talks are seen as critically important in Canada. "We are a small country, and we are a trading nation, and we need NAFTA," Rona Ambrose, a member of the prime minister's NAFTA Advisory Council, told NPR's Ailsa Chang. "There is no doubt about that. So everyone has been seized with this in the business community and the wider community in Canada." But Ambrose said the potential unwinding of NAFTA isn't the biggest issue concerning Canadians. She said they are more worried that Trump will impose stiff tariffs on autos — the major trade sector for the U.S. and Canada. "We're worried because if he does impose these auto tariffs, which is 25 percent on all cars going into the United States from Canada, it would devastate the Canadian economy," Ambrose said. Christopher Wilson, a NAFTA expert at the Wilson Center, said scrapping NAFTA would big a big blow to the auto industry, which is spread across borders. "The auto industry is so integrated across North America that it would be incredibly hard and costly to take it apart," he told NPR's Chris Arnold. NPR's John Ydstie contributed to this story.